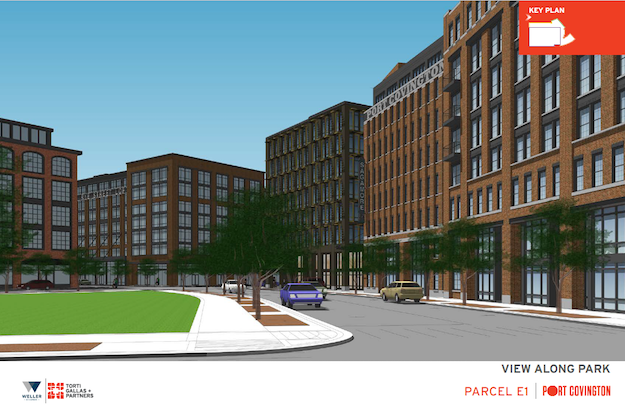 Representatives from Weller Development presented plans yesterday for a seven-story, mixed-use building in Port Covington to Baltimore City Planning Department’s Urban Design & Architecture Advisory Panel (UDAAP). The building will include a parking garage, apartments, retail, and a grocery store. 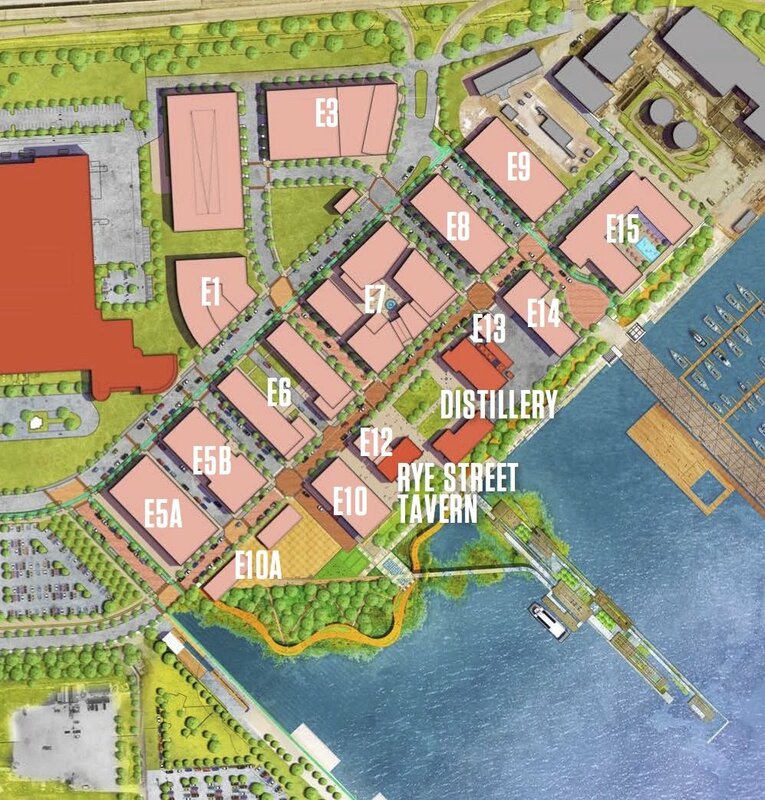 It be located on Atlas St., a new street that will be constructed in the grass lots and parking lots surrounding The Baltimore Sun’s Sun Park. 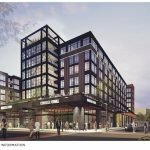 This building is one of eight new buildings that have been presented to UDAAP for the first phase of Chapter 1 in the 235-acre, $5.5-billion, multi-decade Port Covington Development by The Port Covington Development Team. 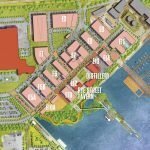 The Port Covington Development Team is comprised of owners Kevin Plank’s Sagamore Development Company and Goldman Sachs Urban Investment Group with Weller Development Company leading the development and construction. The new building will be constructed on plot E1 of Chapter 1. It is just east of Sun Park and northwest of other office and apartment buildings in Chapter 1. Just northeast of E1 will be a triangular grass public park. Torti Gallas + Partners Architects is the designer of E1. 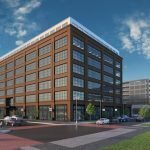 The building is inspired by old Baltimore warehouse architecture with touches of modern and mid-century modern architecture. It will have different setbacks to give the appearance of multiple buildings. The first phase of Chapter 1 is comprised at this point of seven additional buildings that have been presented. This includes a six-story, 290,000 sq. ft. building with 242 apartments and 7,685 sq. ft. of retail lining the first floor at plot E6. A seven-story, 121,600 sq. ft.building with 148 apartment units and 8,200 sq. ft. of ground-floor retail is planned for E5A. 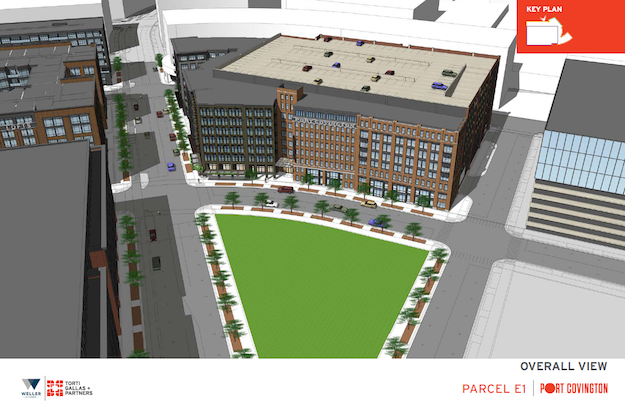 Rye Street Market, which is a four-building project on one block, will be at plot E7. 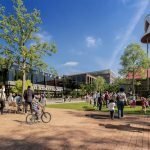 Rye Street Market totals 243,500 sq. ft. and includes a 13,000 sq. ft. open-air market and food hall, 50,000 sq. ft. of pedestrian-oriented retail, 180,000 sq. ft. of office space, and a rooftop event space. The final building is an eight-story, 233,000 sq. ft. office building with retail at E5A.